Jacob Lateiner was one of the great pianists of the 20th century. This set of two of his live recitals is intended to justify that statement to music lovers not familiar with his playing. Jacob Lateiner was born in Havana, Cuba in 1928 of Polish parents. He made his debut at age 10 playing Beethoven’s First Piano Concerto with the Havana Philharmonic under the direction of Ernesto Lecuona. Two years later his parents moved to the United States so that Jacob and his violinist brother Isidor could study at the Curtis Institute of Music. As teenagers, both Jacob and Isidor made their debuts with the Philadelphia Orchestra under Eugene Ormandy, Jacob playing the Tchaikovsky Piano Concerto No. 1 when he was 16. Two years later he performed Beethoven’s “Emperor” Concerto at Tanglewood with Koussevitzky conducting the Boston Symphony Orchestra, to great acclaim. Jacob Lateiner made his recording debut at 21, a performance of Beethoven’s Sonata, Op. 111, for Columbia. In the 1950s, after taking a year off from his career for general music studies with Arnold Schoenberg, he performed and toured widely throughout the United States, Europe, and Australia, including two performances with the New York Philharmonic. During this decade he also began his teaching career, at the Mannes College of Music. In the 1960s, Lateiner became part of the Heifetz-Piatigorsky Chamber Music Concerts series, including making five recordings with the ensemble (one of which, Beethoven’s Trio No. 1, won a Grammy Award for Best Chamber Music Recording). He also began his long association with the Juilliard School of Music, where he was one of the leading piano teachers almost until the end of his life. Carter, which won the Pulitzer Prize in Music. The premiere performance, with the Boston Symphony Orchestra under Erich Leinsdorf, was also recorded and issued by RCA Victor. Although Lateiner’s performing career continued well into the 1990s, he made no commercial recordings after the 1967 Carter Concerto. At his death on December 12, 2010, he was all but forgotten as a pianist. As a teacher, however, he remained prominent, giving master classes throughout Europe and in Israel, Japan, and China in addition to his activities at Juilliard. 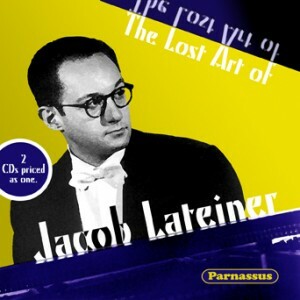 “The Lost Art of Jacob Lateiner” is an attempt to restore his reputation as a pianist. Known as a profound interpreter of Beethoven –an aspect well illustrated in the set–he was also an amazing virtuoso. His playing of the Prokofiev “Toccata” in the 1964 recital on Disc 1 is a superlative example of his power and facility. (At his teacher’s suggestion, he had used this work in his early career as an audition piece for conductors, with great success.) The Brahms “Variations on a Theme of Paganini” in the 1977 recital on Disc 2 demonstrates both Lateiner’s virtuosity and his musicianship. Throughout both discs we are able to hear one of the century’s great pianists at the top of his form. “The Lost Art of Jacob Lateiner” is offered for the price of a single disc, thanks to support from some of his friends and students.